Perfect vector-based clip art drawing software with lot's of business scene clip art! Easy to draw clipart and free download. Perfect vector-based clip art drawing software with lot's of business scene clip art! Edraw Max includes plenty of clip arts. Illustrates all your professional and personal projects with this easy to use software. You'll be able to personalize your business cards, greetings cards, header paper, menus, website and a lot more! 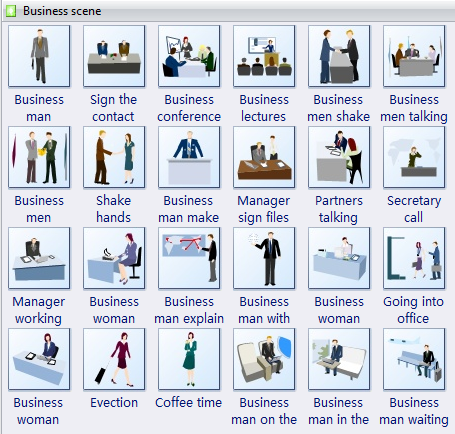 The following business scene clip art templates contain some business scene shapes such as contact signing, business conference, business lectures, business men talking, manager signing files, handshake at coffee time, business man waiting symbols, etc. It's easy to change the color scheme for the clip art in Edraw. Every clipart is drawn by Edraw Software, so you can choose the sub-element in the clip art to recolor it. The following example shows a simple flyer design in Edraw. 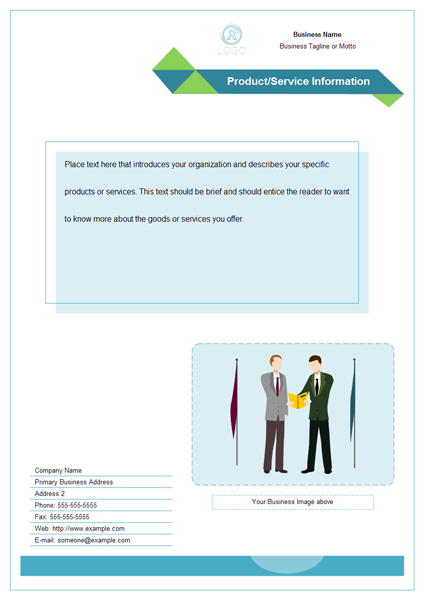 Just insert the business scene clip art to enhance your design easily.